The Mississippi River alluvial plain in northwestern Mississippi (referred to as the Delta), once a floodplain to the Mississippi River covered with hardwoods and marshland, is now a highly productive agricultural region of large economic importance to Mississippi. Water for irrigation is supplied primarily by the Mississippi River Valley alluvial aquifer, and although the alluvial aquifer has a large reserve, there is evidence that the current rate of water use from the alluvial aquifer is not sustainable. Using an existing regional groundwater flow model, conservation scenarios were developed for the alluvial aquifer underlying the Delta region in northwestern Mississippi to assess where the implementation of water-use conservation efforts would have the greatest effect on future water availability—either uniformly throughout the Delta, or focused on a cone of depression in the alluvial aquifer underlying the central part of the Delta. Five scenarios were simulated with the Mississippi Embayment Regional Aquifer Study groundwater flow model: (1) a base scenario in which water use remained constant at 2007 rates throughout the entire simulation; (2) a 5-percent "Delta-wide" conservation scenario in which water use across the Delta was decreased by 5 percent; (3) a 5-percent "cone-equivalent" conservation scenario in which water use within the area of the cone of depression was decreased by 11 percent (a volume equivalent to the 5-percent Delta-wide conservation scenario); (4) a 25-percent Delta-wide conservation scenario in which water use across the Delta was decreased by 25 percent; and (5) a 25-percent cone-equivalent conservation scenario in which water use within the area of the cone of depression was decreased by 55 percent (a volume equivalent to the 25-percent Delta-wide conservation scenario). The Delta-wide scenarios result in greater average water-level improvements (relative to the base scenario) for the entire Delta area than the cone-equivalent scenarios; however, the cone-equivalent scenarios result in greater average water-level improvements within the area of the cone of depression because of focused conservation efforts within that area. Regardless of where conservation is located, the greatest average improvements in water level occur within the area of the cone of depression because of the corresponding large area of unsaturated aquifer material within the area of the cone of depression and the hydraulic gradient, which slopes from the periphery of the Delta towards the area of the cone of depression. Of the four conservation scenarios, the 25-percent cone-equivalent scenario resulted in the greatest increase in storage relative to the base scenario with a 32-percent improvement over the base scenario across the entire Delta and a 60-percent improvement within the area of the cone of depression. Overall, the results indicate that focusing conservation efforts within the area of the cone of depression, rather than distributing conservation efforts uniformly across the Delta, results in greater improvements in the amount of storage within the alluvial aquifer. Additionally, as the total amount of conservation increases (that is, from 5 to 25 percent), the difference in storage improvement between the Delta-wide and cone-equivalent scenarios also increases, resulting in greater gains in storage in the cone-equivalent scenario than in the Delta-wide scenario for the same amount of conservation. 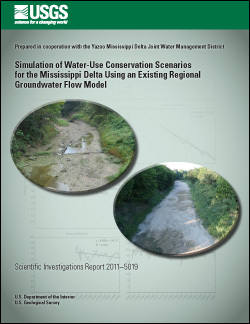 Barlow, J.R.B., and Clark, B.R., 2011, Simulation of water-use conservation scenarios for the Mississippi Delta using an existing regional groundwater flow model: U.S. Geological Survey Scientific Investigations Report 2011–5019, 14 p.